You’ve broken bread and proudly toasted to your family name, celebrating your German heritage by joining with your family and close friends in drink or song. Nothing is more important than these intimate moments of communion—it’s what we live for. But something’s been missing. Drinking German beers out of an ordinary aluminum can or glass bottle has never felt right. How can you celebrate your German ancestry and family tradition when drinking out of such a lifeless vessel? Beer simply tastes better out of a custom engraved traditional glass beer mug. Make every get together unforgettable with a 0.5 liter lederhosen glass beer mug from Germansteins.com. You can show off this traditional German garb without having to worry about pulling off the wardrobe. This item is available for custom laser engraving. Add a custom engraving of your name, a friend’s name, your family name or anything else you can imagine. 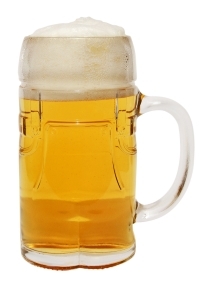 These glass beer mugs feel strong and sturdy in your grip, featuring a thick handle and rock solid construction. Your beer has never been better protected against raucous clinking. With this Lederhosen beer glass, practicality forms a perfect union with tasteful style—the ideal German aesthetic. Every year, gift-giving gets more and more difficult. Everyone around you starts putting less emphasis on gifts and more on just getting together and catching up. Most of your friends are getting older, and won’t send you a Christmas list to reference. So you resort to candles, gift cards, or liquor, because you don’t have any better ideas. A fresh take on the classic 0.5 liter Oktoberfest beer mug, this lederhose glass will be sure to attract attention. This uniquely molded 0.5 liter glass beer mug features the shape of lederhosen with flap on the front, belt and suspenders on the back. Break the trend—stun your friends with a matching set of custom engraved lederhosen beer mugs. Give them a gift they can admire and use for years to come. Combine the lederhosen mug with the Dirndl mug, a couples gift or wedding present for the bride and groom. Shop all glass beer mugs for sale online from GermansSteins.com. Order today and drink every beer in true German style! I bought 4 custom engraved Lederhosen mugs for myself and my 3 very German cousins as a gift this last Christmas, proudly displaying our last name in the "Germany" font. I can already tell they're going to be our drinking companions at every family get together from here on out. This is a great price for a great product. I'll definitely be buying again!